It was louder than the wind. Louder than the thunder even. It blasted 'cross the heavens like a cannon ball in answer to the prayers of saints. And those minions of the dark gasped in one united breath whilst the chains of captives broke like twigs shattered by a mighty wind. And when I heard it, I laughed. I could not help but laugh, for He so enjoyed it. 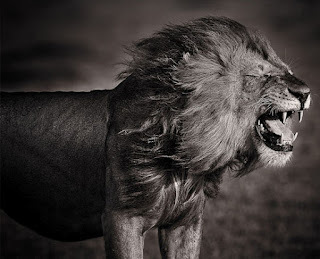 The Lion of Judah loves a good roar!